The paper was presented at Smart Strokes 2014 Conference 28-29 August 2014 Sydney NSW Australia. 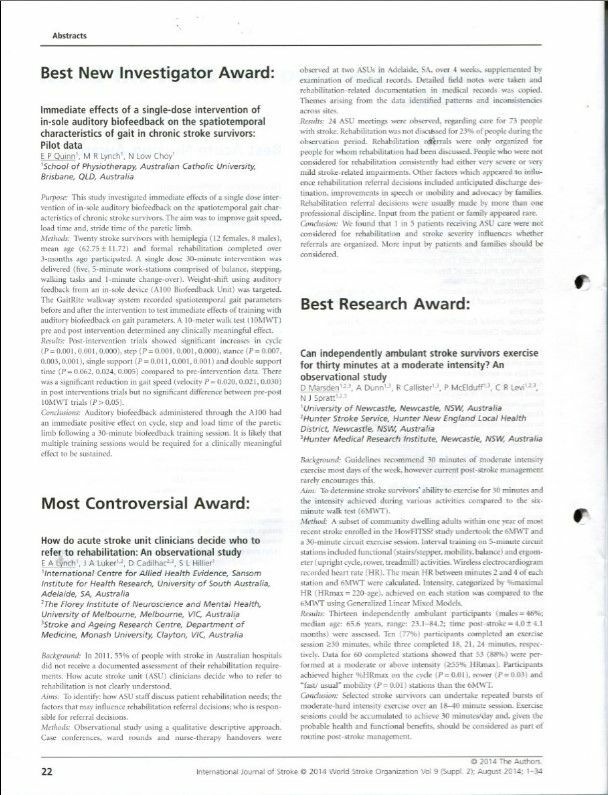 The abstract was printed in the Journal of Stroke Vol 9, Supplement 2, August 2014 and received the “Best New Investigator Award”. This study investigated immediate effects of a single dose intervention of in-sole auditory biofeedback on the spatiotemporal gait characteristics of chronic stroke survivors. The aim was to improve gait speed, load time and, stride time of the paretic limb. Twenty stroke survivors with hemiplegia (12 females, 8 males), mean age (62.75±11.72) participated. Formal rehabilitation was completed over 3-months ago. A single dose 30-minute intervention was delivered (five, 5-minute work-stations comprised of balance, stepping and walking tasks and 1-minute change-over). Weight-shift using auditory feedback from an in-sole device (A100 Biofeedback Unit) was targeted. The GaitRite walkway system recorded spatiotemporal gait parameters before and after the intervention to test immediate effects of training with auditory biofeedback on gait parameters. A 10-meter walk test (10MWT) pre and post intervention determined any clinically meaningful effect. Post-intervention trials showed significant increases in cycle (p = 0.001, 0.001, 0.000), step (p = 0.001, 0.001, 0.000), stance (p = 0.007, 0.003, 0.001), single support (p = 0.011, 0.001, 0.001) and double support time (p = 0.062, 0.024, 0.005) compared to pre-intervention data. There was a significant reduction in gait speed (velocity p= 0.020, 0.021, 0.030) in post interventions trials but no significant difference between pre-post 10MWT trials (p>0.05). Auditory biofeedback administered through the A100 had an immediate positive effect on cycle, step and load time of the paretic limb following a 30-minute biofeedback training session. It is likely that multiple training sessions would be required for a clinically meaningful effect to be sustained. Since 2014 the Biofeedback 100A has been upgraded to the PLLM_Touch (Portable Limb Load Monitor_Touch).